The Klin Products (MORVI) Pvt.Ltd. 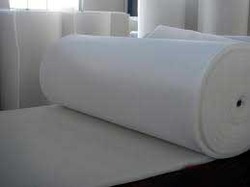 offers a wide range of Cotton Wadding. We are counted among the leading Manufacturers, Suppliers and Exporters of Cotton Wadding. Our Cotton Wadding is well known for superior quality and high elasticity. Our Cotton Wading finds applications in various industries. We offer Cotton Wadding at very reasonable prices. Established in 1947, The Klin Products (Morvi) Pvt. Ltd. has created a name for itself in various industries. We are looked upon as the most credible Manufacturers, Suppliers and Exporters of Bleached (White) & Grey (Natural) Cotton Wadding/Batting, Thermal & Chemical Bonded Polyester Wadding/Batting, Heat Sealed Polyester Wadding/Batting, Recycled Cotton Wadding/Batting & Recycled Polyester Wadding/Batting, Bleached Cotton, Cotton Wadding with Non-Woven Layer. (Our all Wadding are available in wider range of Width: 40" to 122" & GSM range: (40 to 1400++ & in cont. long length) & also Absorbent Cotton (Surgical Cotton), Cotton Sanitary Napkins. Our products match the highest quality standards. We have in house R&D, Quality Control & Testing facilities to ensure that the products, which our valued clients procure from us, are completely flawless.It is our pleasure to state that we are a customer centric company. We have a widespread network to promptly cater to the needs of our clients. Our dedicated team of professionals is available round the clock to entertain the queries of the clients. We are completely committed to maintain consistency in providing our qualitative products on time. Moreover, we have priced our products very reasonably so that more and more organizations can procure our qualitative & tailor made products. We cater various industries related to Home Textiles, Home Decor, Textiles and Made-ups and Quilting Industries, etc.